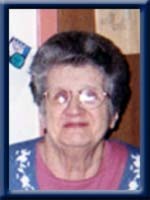 JOUDREY – Thelma Mae, 86, of Bangs Falls, Queens County passed away peacefully on Wednesday, March 27th, 2013 in North Queens Nursing Home, Caledonia. Born in Milton, Queens County, she was a daughter of the late Clifford and Annie (MacKinnon) Dexter. In her earlier years, Thelma worked as a cook for Hillsview Acres in Middlefield and at the former Fahie’s Nursing Home in Liverpool. She also worked for a shoe factory in Milton. She loved to garden, fish and to knit. She was recognized for her volunteer effort for knitting mittens for those in need. She is survived by her daughters Dianne Mansfield and Annie (Reide) Mansfield, both of Westfield. Her sons Joseph of Bangs Falls, David (Bonnie) of Westfield and Wade (Jane) of Chelsea. 10 grandchildren and a number of great-grandchildren and great-great-grandchildren. She was predeceased by her husband Raymond, her daughter Christine , her granddaughter Vicky and grandsons Wade and Harvey. great-granddaughter Robin, her sisters Margaret, Thelma and Phyllis and her brothers John, Sydney, Francis, Curtis, Marsdon, Joseph, Rosevelt, John and Dean. Diane, Annie, Joey, David and Wade, my condolences on your mom’s passing. This is a great loss to all who knew her. Thelma was a great lady. Dear Annie…my sincerest condolences to you and your family. So sorry to hear about your mom’ she will be greatly missed.Isure will miss her when i go to the nursing hometo visit everyone’ i always went to see her. Dear Annie and family, I am so sorry to learn about your Mother’s death. I know she will be greatly missed by all who knew her. She was always gracious and fun to talk to at the nursing home when I visited in the summer. May your wonderful memories of her give you comfort and strength. I will keep the family in my thoughts and prayers. Alltough we live just across the road from one another, we always can set our watches by Bonnies’ car leaving to work on the early mornings. David we were not as close to your mother as many people, but your mother always liked to hear (Byron) play the organ. discomfort, please let us know. I played (Byron) for the Calvary Baptist Church’s Nursing Home Service and as soon as the Music started the room filled… I cannot say if she was there or not…. I want to extend my deepest sympathy and prayers to you the family on the passing of your Mom. She was such a gracious lady and always loved to have us come to the Nursing Home. She lived a good life and just cherish the memories you have of her. May God’s blessing be with each and every one of you during these difficult days. Thank you for your kind messages of condolence. We appreciate your thoughtfulness and kind words. Thelma lived a quiet and simple life and her greatest joy was her family and friends. God bless you all as we were blessed to have her in our lives.